The March 22, 2019 auction entitled "Power and Prestige," contains important early ritual Chinese bronzes from an important European collection. Lot 1509 is the Ge Zuo Cong Yi Fangding, a rare bronze ritual rectangular food vessel from the Early Western Zhou Dynasty, 11th-12th Century B.C. It is 8 1/2 inches high. According to the catalogue entry, the "present fangding was once in the collection of Henri Hoppenot (1891-1977), a French diplomat who served in many illustrious posts, including that of French president of the United Nations Security Council, Plenipotentiary Officer at Montevideo, and the French Ambassador in Bern, Switzerland, where he was an honorary Member of the Museum of Fine Arts. He was also the last person to hold the position of Commissioner-General of France in Indochina from 1955-56. Together with his wife Hélène, who was an accomplished photographer, Henri Hoppenot produced the book Extrême-Orient, Neucha^tel, 1951, which contains photographs of religious architectural sites and ethnographic scenes in East Asia." The lot has an estimate of $500,000 to $700,000. It sold for $550,000 including the buyer's premium as do all results mentioned in this article. The auction total was $4,551,500. Lot 1504 is the Tie Zhu Gu, a very rare pair and finely cast pair of bronze ritual wine vessels, Late Shang Dynasty, 12th-11th Century B.C. The vessels are 12 1/4 inches high. It is the cover illustration of the catalogue. The pair was exhibited in London in 1951 at The Oriental Ceramic Society when it was in the collection of Mr. and Mrs. R.E.R. Luff of London and in 1982 it was owned by Bluett and Sons in London. Each vessel is cast on the trumpet-form neck with four leiwen-filled blades rising from a band of S-shaped serpents. The middle section and spreading foot on either side are cast with the disconnected parts of a taotie, those on the foot below a band of kui dragons. 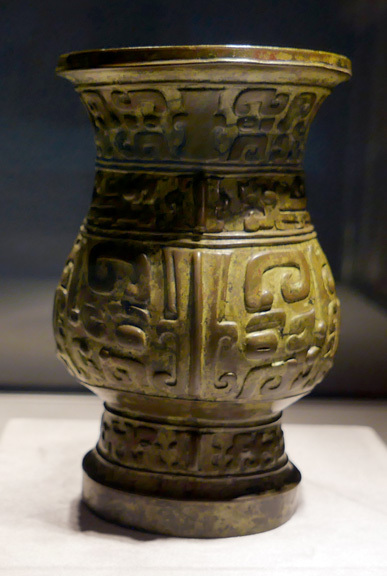 The catalogue entry notes that "Only a few gu with flanges extending over the mouth rim appear to be published: one similar gu with a Zi Wei clan sign, found in M2508 in the Western district of Anyang city, is illustrated in Shang Ritual Bronzes in the National Palace Museum Collection, Taipei, 1998, p.291, fig. 43:2; and another similar gu in the Freer Gallery is illustrated by John Alexander Pope and Rutherford J. Gettens in The Freer Chinese Bronzes, vol. 1, Washington D.C., 1967, pp. 68-73, no. 10. (fig. 1) On these examples, the flanges not only emphasize the layout of the design but also serve to enhance the elegant form and sense of large size." The lot has an estimate of $400,000 to $600,000. It sold for $543,000. Lot 1506 is the Shao fangding, a rare and important bronze rectangular ritual food vessel, Late Shang Dynasty, Anyang, 11th Century B.C. It is 8 1/8 inches high. The lot was formerly in the collections of Huang Jun (1880-1951), Zungu Zhai, Beijing, prior to 1942, Hans Jürgon von Lochow (1902–1989) Collection, Beijing, by 1943, The Edward T. Chow (1910-1980) Collection, Bella and P.P. Chiu Collection, by 1988 and Eskenazi Ltd., London in 1996. "The illustrious provenance of the Shao Fangding can be traced back to 1942, when it was first published by Huang Jun (1880-1951) in his Ye zhong pianyu sanji (Treasures from the Ye [Anyang] Series III). Huang Jun, who goes by his literary name, Bochuan, graduated from the late Qing government school for teaching Western languages, Tongwen Guan. He spoke German, English, and French, and served as a translator in a German bank after graduation while working part-time in his uncle’s antique shop, Zungu Zhai. He later became manager of Zungu Zhai and one of the most prominent figures in the antique trade in Beijing. Huang Jun not only handled some of the most important archaic bronzes and jades, but also published them in catalogues such as the Yezhong pianyu series, Zungu Zhai suo jian jijin tu chu ji, and Guyu tulu chuji (First Collection of Ancient Chinese Jades), which is almost unique for his generation of Chinese dealers. The Ye zhong pianyu series has great academic importance, since most of the pieces are believed to be from the late Shang capital Anyang (ancient name Ye). Most of the 133 bronze vessels included in the series are now in museum collections, with only a few remaining in private hands. Huang Jun probably sold the Shao Fangding directly to Hans Jürgon von Lochow (1902–1989), a German collector who lived in Beijing. Von Lochow amassed a carefully selected, world-class collection of archaic bronzes, and the Lochow Collection was published by Gustav Ecke, another German who lived in Beiing and collected and studied ancient Chinese art. Upon von Lochow’s return to Germany, he donated most of his collection to the Museum für Ostasiatische Kunst, Cologne, while only a few of his pieces, including the Shao Fangding, went back on the market, passing through the hands of some of the most important dealers and collectors. 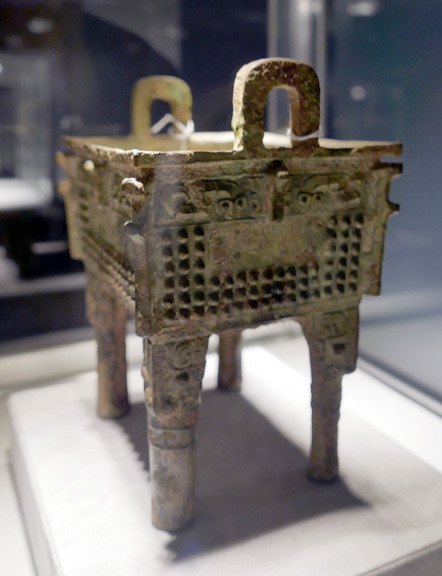 "Symbolizing royal power, fangding vessels had great significance for Shang ruling elites. 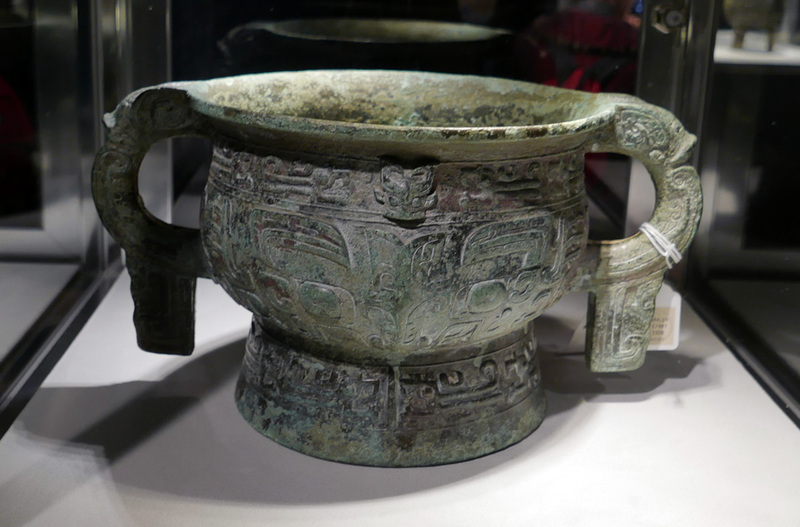 The largest extant Shang bronze ritual vessel is the Si Mu Wu fangding, measuring 133 cm. high and weighing 875 kilograms, found in Wuguan village, Anyang city, in 1939, and now in the National Museum of China, and illustrated in Zhongguo qingtongqi quanji: Shang 2 (Complete Collection of Chinese Bronzes: Shang), vol. 2, Beijing, 1997, p. 48, no. 47. While massive fangding vessels were made exclusively for kings and queens, fangding of regular size were reserved for high-ranking aristocrats. The Shao Fangding’s superb proportions and elaborate decoration, especially the dragon motifs cast on the outer sides of the handles, an area that is usually left undecorated, demonstrate the sophistication of bronze design and casting in the late Shang capital, Anyang. There appear to be only a few published examples that may be cited as parallels. A similar, but smaller, late Shang fangding (18.7 cm. high) in the Nelson-Atkins Museum of Art, Kansas City, is illustrated by R. Bagley in Shang Ritual Bronzes in the Arthur M. Sackler Collections, Washington, D. C., 1987, p. 475. It is interesting to note that the Nelson-Atkins fangding is also from the collection of Huang Jun, and is illustrated in the Yezhong pianyu erji, Beijing, 1937, vol. 1, p. 3. Another similarfangding (20.8 cm. high), lacking the relief taotie masks at the top of the legs, is also illustrated by R. Bagley, ibid, pp. 472-74, no. 88. A larger example (26 cm. high) in the Pillsbury Collection, is illustrated by B. Karlgren in A Catalogue of the Chinese Bronzes in the Alfred R. Pillsbury Collection, Minneapolis, 1952, pl. 1, no. 1. Compare, also, the Ya Yi Fangding, sold at Christie’s New York, 14-15 September 2017, lot 907. The taotie motifs on these four similar examples have regular C-shaped horns rather than the rare dragon-shaped horns on the present Shao Fangding." The lot has an estimate of $1,000,000 to $1,500,000. It sold for $1,095,000. Lot 1508 is an impressive and large bronze food vessel from the Early Western Zhou Dynasty, 12th-11th Century B.C. It is 15 inches in diameter. "Gui of this type, which were used to hold offerings of grain, were popular during the early Western Zhou period. They typically feature a broad register comprising two taotie masks above a narrower register of dragons, snakes or birds that encircles the foot above the bevel, and is sometimes repeated in a narrow register below the rim of the vessel. The handles of these gui are usually surmounted by animal heads with either blunt horns or prominent C-shaped horns that lay flat against the side of the head, such as those seen on the present vessel. The sides of the handles are cast with simplified curved wings, while claws and hooked tails are cast on the pendent tabs below. "Whilst the present gui displays many of these features typical of the early Western Zhou period, it is of unusually large size and imposing proportions. A gui of comparable size (37.5 cm. 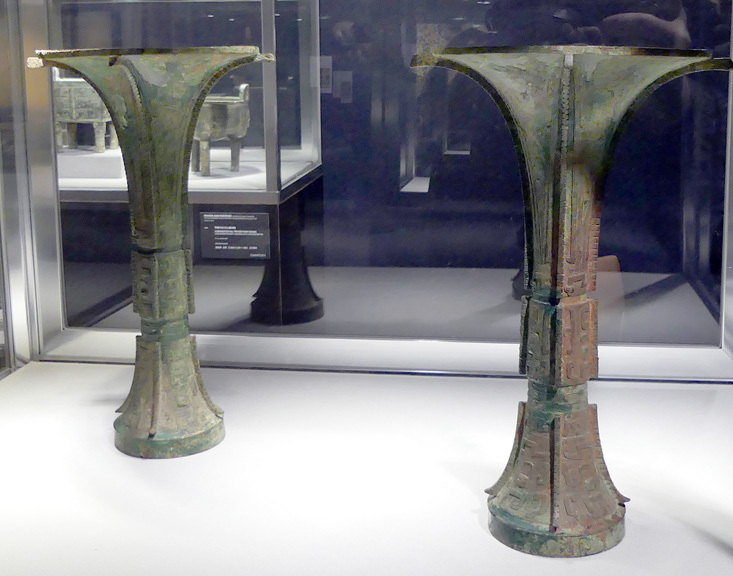 across the handles), with a similarly-formed tall spreading foot, dated to the early Western Zhou period, is in the Arthur M. Sackler Collection, and is illustrated by J. Rawson in Western Zhou Ritual Bronzes from the Arthur M. Sackler Collection, Vol. IIB." The lot has an estimate of $500,000 to $700,000. It sold for $555,000. Lot 1503, the Peng Zhou Zhi, is a rare and fine bronze wine vessel from the Late Shang Dynasty, 12th-11th Century B.C., It is 5 1/2 inches high. The catalogue entry has 12 publication references. "The clan sign cast inside this vessel depicts a figure carrying a string of cowrie shells while standing in a boat. In traditional literature, this clan sign was translated as 'zi he bei (son bearing cowrie)'. More recently, most scholars translate it as peng zhou (literally 'string of cowrie shells' and 'boat'), however, other scholars translate it as ying zhou (literally 'infant' and 'boat'). The same clan sign can be found on a ding vessel from the Sackler Collection, sold at Christie’s New York, 17 March 2017, lot 1006, and on other bronzes which are listed by R. Bagley in Shang Ritual Bronzes in the Arthur M. Sackler Collections, Washington, D. C., 1987, p. 459. "The previous owner of this zhi, Yu Xingwu (1896-1984), was a pre-eminent epigraphist, scholar of ancient artefacts, and collector. Yu Xingwu, whose hall name is Shuangjianchi Zhuren (master of Shuangjianchi Studio), taught epigraphy and ancient artefacts at Fu Jen Catholic University and later at Peking University during the Republic period. He became a professor at Jilin University in 1955. As a scholar-collector, Yu Xingwu focused on pieces with academic significance and was very cautious in their authentication. For him, collecting was not merely a leisurely activity, but a scholarly pursuit in dating, naming artefacts, and interpreting inscriptions. 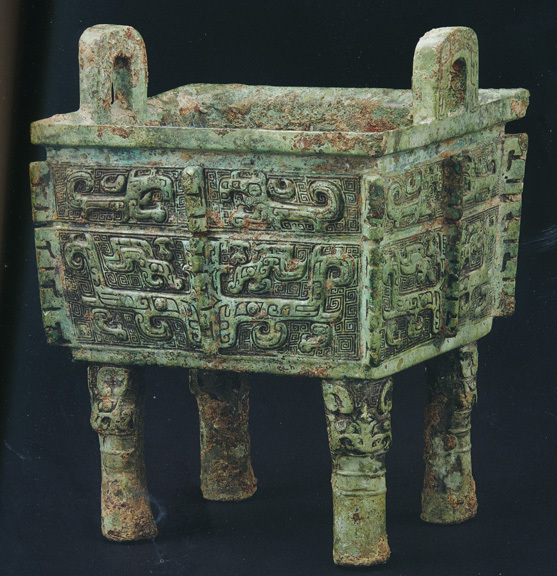 "An almost identical bronze zhi, with a Shi clan sign, in the Shanghai Museum, is included in the exhibition catalogue by Wang Tao, Mirroring China’s Past: Emperors, Scholars, and Their Bronzes, Chicago, Art Institute of Chicago, 2018, p. 64, no. 32." The lot has an estimate of $150,000 to $250,000. It sold for $300,000.